The storyline is actually fairly strong, even though I wish more time had been spent between Yamada and Khaam. There is talk later in the film about their friendship, but with the exception of a couple of scenes I never really got the feeling that their friendship was “earned”. 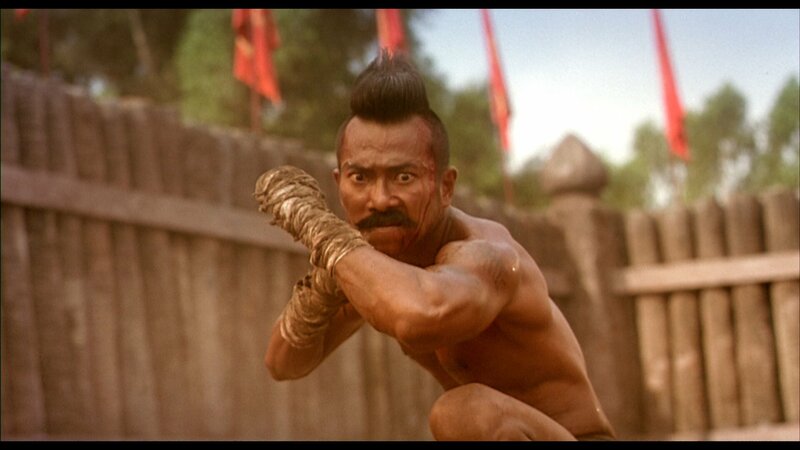 Speaking of which, Khaam needed to get his own damn movie, ‘cause Thanawut Kasro was all kinds of badass. His look, with that crazy moustache and mohawk, was just chilling. The other actors did a fine job, but I found the Japanese characters were just stock characters, and offered nothing to the narrative except as cackling bad guys. The story moves at a good pace, but I never really felt any particular emotion for any of the characters one way or the other, as no other characters were in “danger” except for the two principles. The fights were also a source of disappointment, but not for the normal reasons. The choreography itself was okay, but screamed for Panna Rittikrai to do them. The actors and stuntmen could do more than what they were given, but did well with what they had. The real failing that drove me insane was the overuse and poor quality of the CGI blood scenes. They were terrible, and looked like something out of a PS2 game. Either do it right or just use real blood and a good makeup artist. This is a practice that just needs to stop in films like this. The CGI crappy blood effects took me out of every fight they are used in, which is bad because the fights in question are the two biggest set pieces of the film. It was unnecessary and ruined otherwise decent fight choreography. 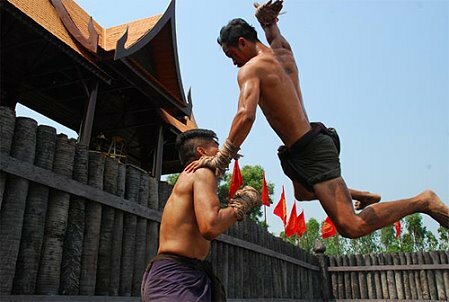 Muay Thai Warrior has a decent story and fair fight scenes that are just enough for me to recommend it, but the CGI blood scenes dropped my score considerably. You can purchase this film now from Wellgo Entertainment here. Next Donnie Yen brings his “A” Game to Special ID Trailer! I believe this is on Netflix. I will watch it and see if my assessment and evaluation lines up with yours so that I can do a comparative analysis of your style and my developing style. I just watched the movie on Netflix. I concur with your assessment and evaluation. The Japanese fighter had gorgeous hair. He just did not move with the force, speed, agility and reflexes of those disciplined MT warriors. Those MT warriors worked the hell out of those swords and their kill moves were off the charts. I want those boys on my team. Triple WOW for men like that. Those actors had exceptionally large ears. I enjoyed the movie and the fight scenes with the MT Warriors. thank you. I did not like the CGI blood how could the Japanese be in love with Champa he never touch her, she was to young and not the right person for that part. I’m not a fan of CGI blood either, Irene. Unfortunately that’s where the industry is headed.